I’m not one to use words like, “best” and “ever” lightly. For that matter, nor am I one to utilize kale in a manner that does not best serve it’s magical abilities. I think I’ve done it here. I just spent this past weekend with Pearlie and our parents in San Francisco for our fair mother’s birthday. We held hands and frolicked through Fort Mason’s Art Market, oogling over whimsical paintings and guffawing at a few of Andy Warhol’s polaroids. We shared a fresh pea and fava bean mash salad at Stone’s Throw in Russian Hill and praised our server for her fairy-like personality. I can’t imagine a more San Franciscan weekend. It was filled with the stuff that makes up my childhood memories and enriches one’s soul. Back to our home on a hill in Woodside, my father gave me a tour of his new vegetable garden. He built the planter boxes, dug the irrigation trenches, and lined each box with pest-deterring marigolds. Splendor is the only word that comes to mind. In the five months since I’ve been home, this garden has grown abundantly. It has provided my parents with a plethora of foliage: gargantuan stalks of lacinato and Russian kale, spicy arugula, squash, cantaloupe and tomatoes. I couldn’t wait to fill a big salad bowl for dinner. Loosely adapted from one of Sarah Britton’s recipes as well as the mash we ravaged at Stone’s Throw, this recipe is hearty and perfect for a springtime dinner. It inspired a bit of gratitude from our dinner table. We were silent (for once in our lives) as we tasted each ingredient from our backyard garden. This perfect meal was eaten around a table that I have dined at for 25 years and it made me proud to have been raised in such a loving and compassionate family. Now, onto the food. 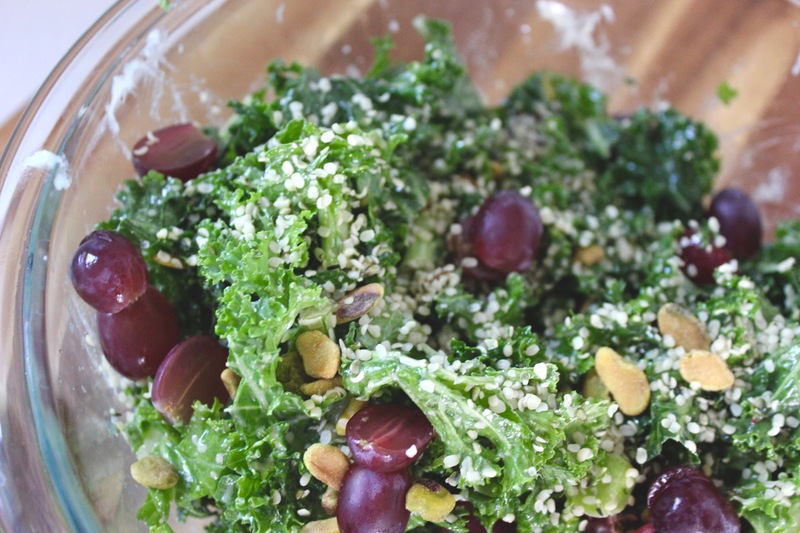 This salad was the first in which I danced and hopped into the massage-your-kale-parade. I’m a party girl now. Getting your hands deep in a bowl of olive oil, lemon juice, and kale does wonders on the veggie’s tough spines and leaves. 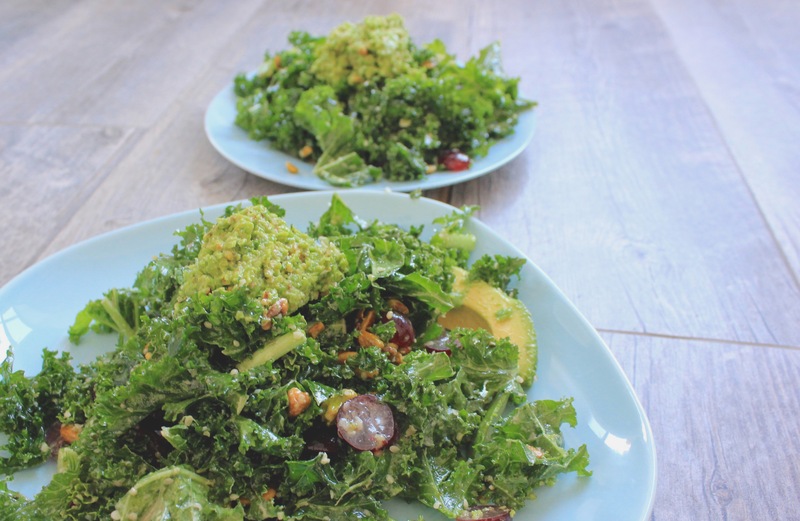 As a main dish, there is a perfect balance between the crunchy pistachios and hemp seeds, sweet grapes, soft avocados, and the light vinaigrette. Avocados are perfectly satiating while the nuts and seeds provide a healthy dose of plant protein. I used some truffle-infused olive oil that I found in my parent’s cupboard which tied everything into a nice froth-worthy dish. If all you have is regular olive oil, you are in good shape with that as well. Topped with the pea mash, this is the best salad I’ve ever had. With an immersion blender or small high-speed blender, pulse and blend all ingredients until well incorporated and emulsified. Set aside. Place all ingredients in a medium-sized bowl if using an immersion blender. Pulse until peas are crushed and mash is the consistency of hummus. You may do the same in a blender or high-speed mixer. There was quite a bit leftover, but I use this recipe on everything. It will keep in an air-tight container in the refrigerator for up to a week. 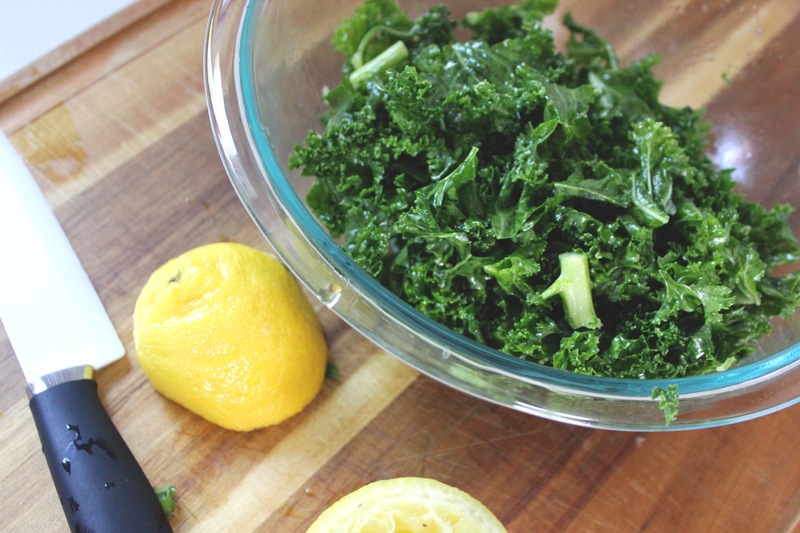 In the large bowl where the kale has been softening, add each ingredient listed above. Dress with the vinaigrette and toss. 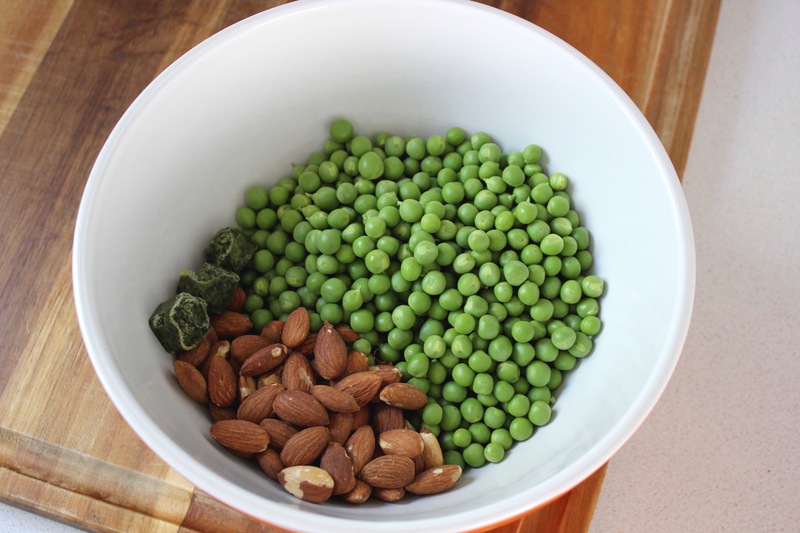 Distribute onto four plates and top with a large spoonful of the pea mash. Eat! You are correct. Your creation was a work-of-art. I love your writing also. I felt as though I was experiencing your and your dad’s salad all over again. Please come home now and cook for us every night. Love your mama.